How did I start with my professional web publishing career? What was I doing before? How did I get to name myself Robin Good from Sharewood? What do I see in the future of those wanting to find a way to leverage the Internet to do and live off what they are really passionate about? 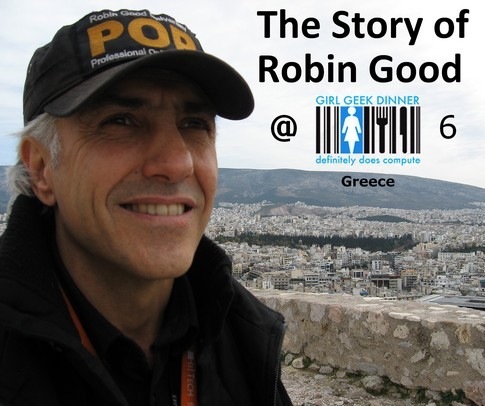 If you want to find out a bit more about my story as an online independent publisher, how I started and how converted my total resistance to advertising into a win-win partnership, my unrehearsed performance / presentation at the 6th Girls Geek Dinner in Athens, Greece, this past weekend, is definitely a good opportunity to know a bit more about how it all came to be. I have watched the video and it was very interesting and really enjoyable!! I highly recommend taking the time to either read through the transcript or watch the video… he is quite funny so the video is more recommended.